Flowers Gallery is pleased to announce an exhibition of works by the late British artist Michael Kidner (1917-2009), on display at Flowers Gallery, 21 Cork Street, London. In Black and White runs from 5 September until 13 October 2018. For more information visit flowersgallery.com. Louis Stern Fine Arts is pleased to announce an exhibition exchange with Flowers Gallery in London, England. 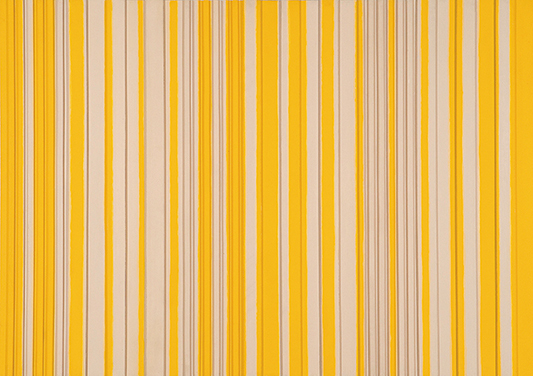 Taking place this summer, the exhibitions in the two galleries will focus on the diverse forms of abstraction taking place in Britain and California in the 1960s. On view at Louis Stern Fine Arts will be an exhibition of works by leading British abstract painters Bernard Cohen, Richard Smith, and Michael Kidner, whose pioneering and formally innovative work helped define the vibrant cultural scene of London in the 1960s. On view in London at Flowers Gallery will be a selection of works by gallery artists Helen Lundeberg, Lorser Feitelson, and Karl Benjamin. These three artists were active in the Los Angeles area, and heavily influenced the California art scene during the 60s. The Exhibition at Louis Stern Fine Arts, West Hollywood runs from July 21 until September 8 2018. For more information visit louissternfinearts.com. 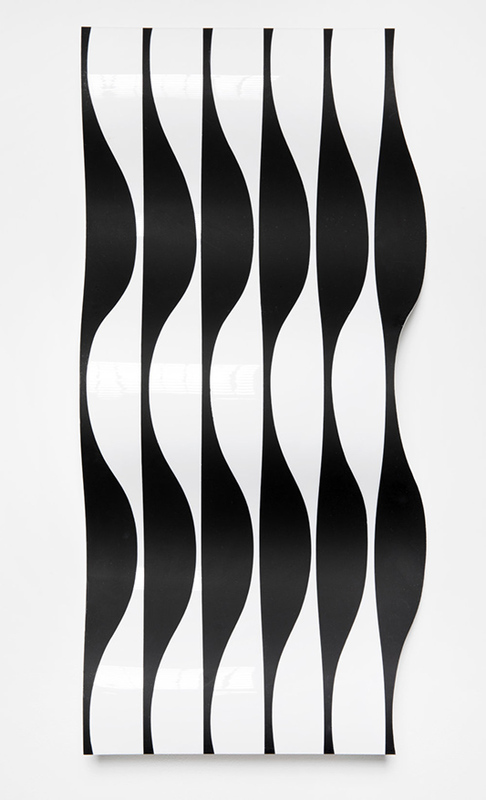 Michael Kidner is featured in a group exhibition of work by five artists, bound by their use of experimentation in devising rules to generate algorithmic form. 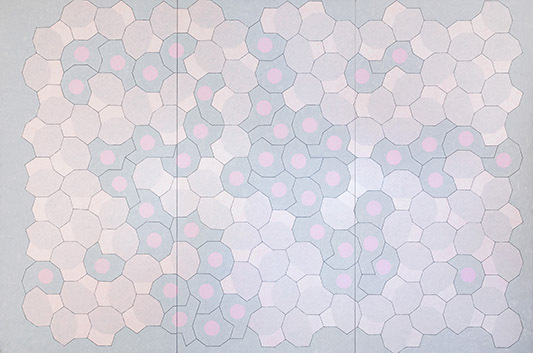 Love is a Virus From Outer Space represents Kidner’s fascination with patterns that appear to fluctuate between order and disorder, using the irregular pentagon as the basic structure to tile the plane of the painted surface. Kidner draws on the instability of the geometric structure to introduce an element of chaos, considering the pentagon an ideal metaphor for both space and uncertainty. The cellular-like composition of the image (and its playful title) also implies reference to the hidden structures of the natural world, such as organic forms seen through the lens of a microscope, which shape not only the construction of the visible world but also the basis of human behavior. The exhibition features Michael Kidner, Beryl Korot, Manfred Mohr, Jack Smith and Judith Stenneken, and runs from 17 July until 24 August 2018 at Flowers New York, 529 West 20th Street. For more information visit comptonverney.org.uk. Michael Kidner is featured in a new exhibition at Tate Britain. Systems was a group of artists formed in 1969. 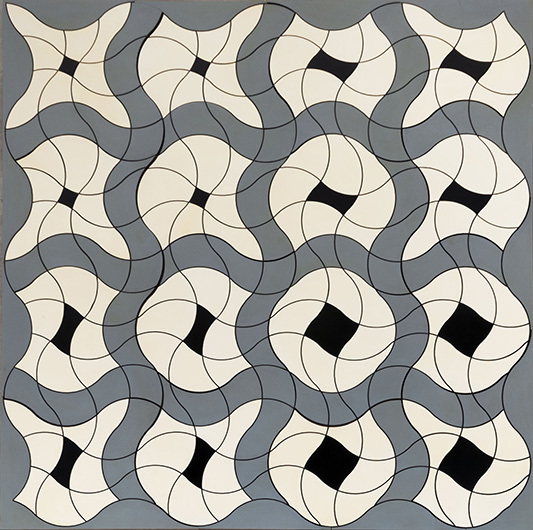 One focus for these artists was a belief that following a rational, systematic, procedure (often based in mathematics) to make artwork was often as important, if not more so than the finished object. This theory influenced their work in different mediums from painting to sculpture. Their concentration on a practice based in theory, forms one foundation for contemporary artists’ working-practice today. This display presents work by the group’s core members from their most significant moment, an Arts Council touring exhibition in 1972–73 that originated at the Whitechapel Art Gallery in London. It includes paintings and sculptures as well as drawings, photographs and plans of final works that illustrate Systems’ defining methodical working process. Shown above is Kidner’s Column in Front of its Own Image II which is included in the display. The exhibition at Tate Britain runs from 18th July 2016 to 17th April 2017. 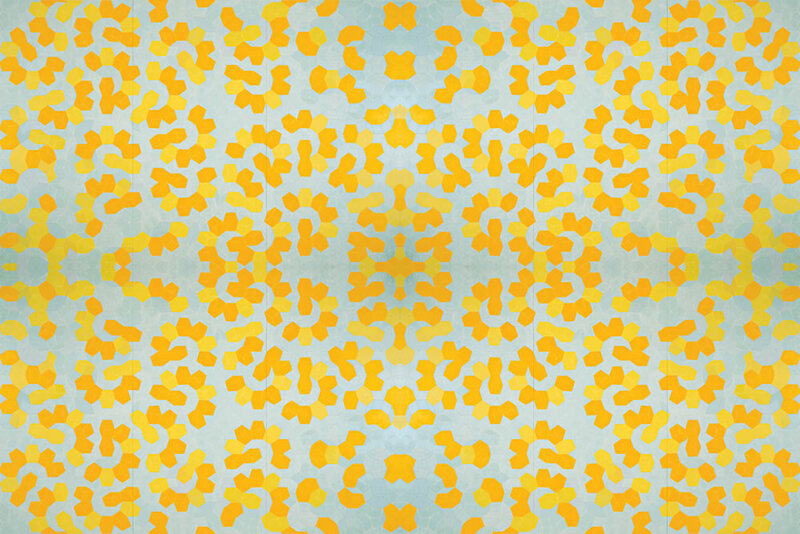 Flowers Gallery, New York is exhibiting works on paper by Michael Kidner. Michael Kidner – Works on Paper surveys two important periods of development during his long career, including works from the 1960s and the 2000s, and runs from 21st July until 27 August 2016. 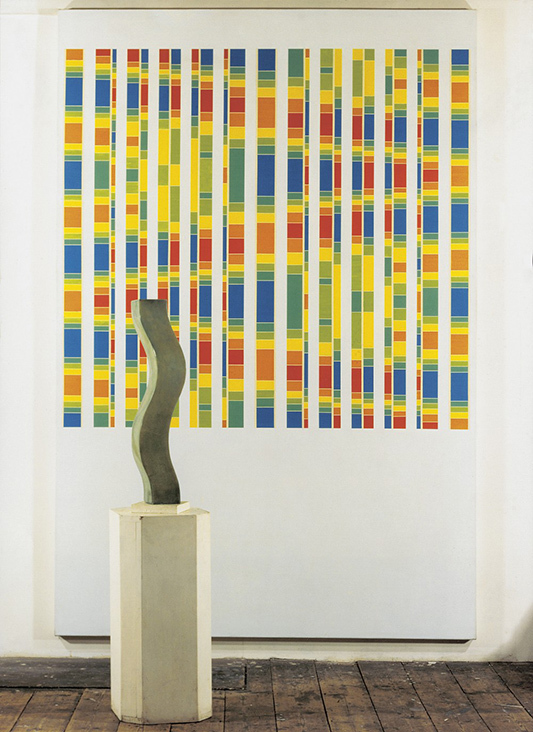 Michael Kidner was described by American art historian and critic Irving Sandler as “arguably the first Op Artist in Britain”, following his investigations of the optical effects of light, color and systemic structure during the 1960s. Optics presented Kidner with a challenge in his pursuit of a pure form of imagery, seeking a phenomenological approach to the fluctuating effects of light and color within the space set by the canvas. The present exhibition explores four key areas of Kidner’s investigations of the image: After Image, Stripe, Moiré and Wave. The After Image series captured the vivid, pure impression of a retinal after-image – exploring the searing effects of oppositional colors in facing circular and angular forms. 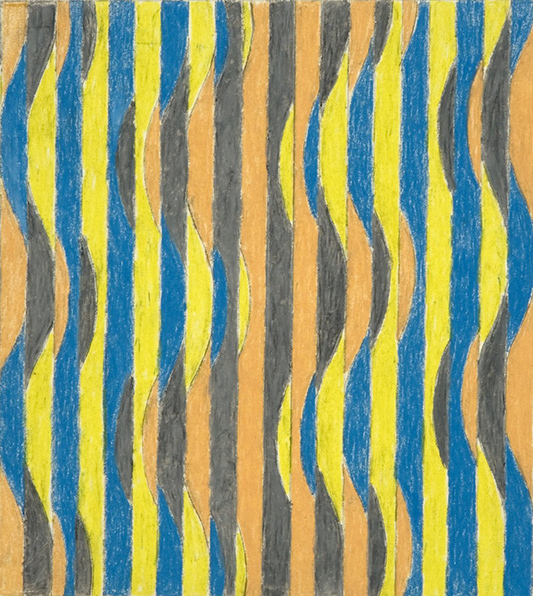 Kidner’s Stripe drawings from the mid-1960s structured the visual field into rationally organized alternating bands of color, to create a non-prescriptive mode of expression. The introduction of an angled band, dissecting the parallel stripes, produced a moiré pattern with an enlivened sense of color movement. This form of perceptual interference represented a breakthrough for Kidner, as he said: “I was now satisfied that the content of the picture was visibly connected to its structure”. 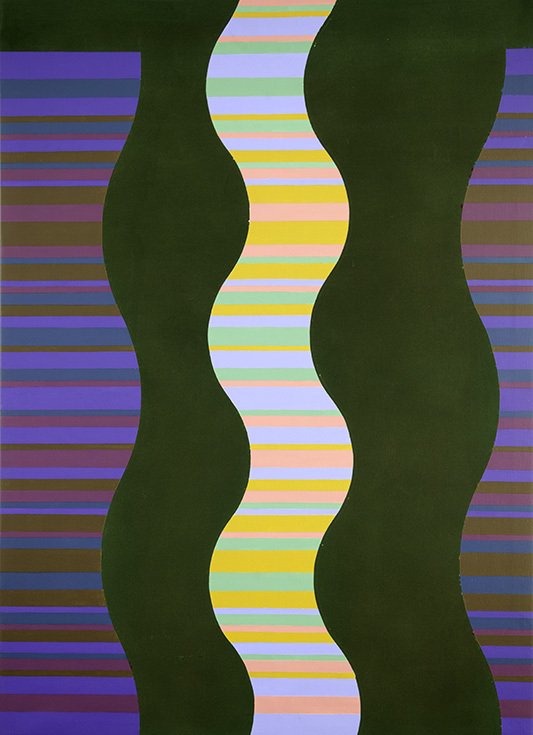 The patterns that emerged in his series of Waves during the latter half of the decade countered the perceived infinity of the stripe, with cycles emerging through the correlation of alternate undulating forms. Untitled from 1966 (oil pastel on paper) is shown above. A one-day exhibition of work by textile students and staff from Manchester School of Art inspired by Michael Kidner was held at Flowers Gallery, Kingsland Road on 5th July 2016. Seven students were selected to develop work for this exhibition from a field of fifty students who responded to the project. 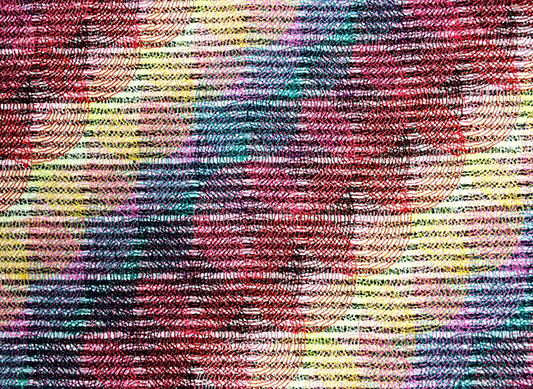 Painting Into Textile acts as a showcase for Manchester School of Art, which has a rich contemporary breadth of inventive textile practice which is founded on the history of the Arts and Craft design principles of Walter Crane. Georgina Heaton’s Reformation of Colour is shown above. Michael Kidner will be featured in a new show at Flowers Gallery, Kingsland Road during January and February 2015. Seven from the Seventies brings together the work of seven influential abstract painters from the decade, and also includes Colin Cina, Bernard Cohen, Noel Forster, Derek Hirst, Jack Smith and Richard Smith alongside Kidner. Each demonstrates a reductive and disciplined articulation of the sensations of light, form, sound, colour and space. Their mutual rejection of expressionism for an ordered, procedural and systematic approach to painting opened up new possibilities for future formal experimentation within abstraction. During this period, all seven artists were at the height of their artistic careers, exhibiting in important solo and group presentations internationally and at major British institutions including the Tate Gallery, the Institute of Contemporary Arts, The Hayward Gallery, the Serpentine Gallery and the Royal Academy, London. With prominent roles in British art schools as well as international professorships, their ideas impacted upon a generation of artists. Michael Kidner’s translation of the dialogue between order and indeterminacy into a visual language has meant that his work, though founded in a rigorous intellectual approach to colour and form, also resonates emotionally: ‘Unless you read a painting as a feeling,’ he has said, ‘then you don’t get anything at all’. Column No.2 In Front of Its Own Image (1972-3) systematically records the grid or lattice formed by the movement of a three dimensional object in space, itself a solid representation of the intersection of two wavy lines. Exploring the complex effects achieved by the arrangement of simple elements according to a set of self-imposed rules, he generated “visual metaphors for the opposing manifestation of order and disorder in nature” (Irving Sandler). The show runs from 16 January to 21 February 2015 at Flowers Gallery, Kingsland Road, London. For more information visit flowersgallery.com. Michael Kidner is featured in the Royal Academy of Art’s 2014 diaries, along with the work of other notable Royal Academicians including Barbara Rae, Terry Frost, John Hoyland and Albert Irvin. To buy or find out more, visit the RA’s site at shop.royalacademy.org.uk. After the recent dramatic downpours, the Tate Weather campaign proves it’s not all bad news when it comes to the forecast for the new year! The digital display campaign runs on the London Underground until March 2014, and features the work of various artists, including Michael Kidner, on screens across the tracks on Thursday and Saturday afternoons. Each work is chosen to represent the likely weather for the weekend – so keep your fingers crossed for a glimpse of Kidner’s Yellow Grey Relief (shown above) which was chosen to represent a nice warm and sunny day!